Bhagwan Shree Rajneesh drives one of his Roll-Royces as Ma Anand Sheela walks alongside in this photo from The Oregonian archives. He was a war hero in the Second World War, coming home to Oregon with a Silver Star and four Bronze Stars. He was one of the greatest track and field coaches of the 20th century – coaching his University of Oregon track and field teams to four NCAA titles, and over 30 Olympians. He would go on to co-found a company that would possess one of the greatest brands today – Nike. 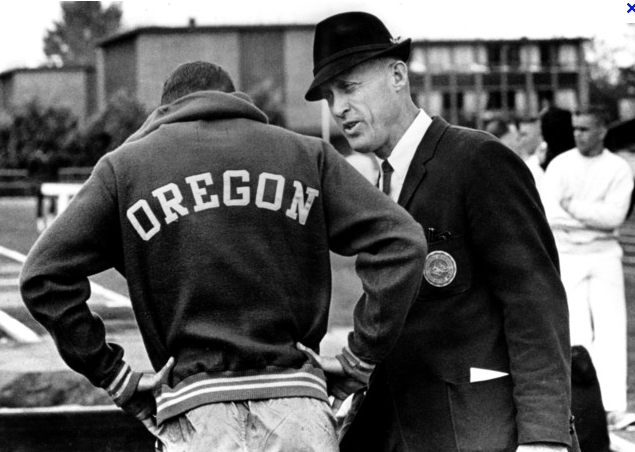 Bill Bowerman was a giant in the world of sports. And has been revealed in an amazing Netflix documentary series – Wild Wild Country – he was also an activist, standing tall in the face of a religious commune that tried to buy and build its way into a quiet farming and ranching community in central Oregon. In 1981, a 64,000 acre plot of land called the Big Muddy Ranch was sold to an organization affiliated with Bhagwan Shree Rajneesh, the leader of a religious movement founded in Pune, India. The organizers, led by charismatic secretary to the Bhagwan, Ma Anand Sheela, informed Margaret Hill, the mayor of Antelope, the closest town to Big Muddy Ranch, that the commune would have no more than 40 people employed on the ranch. But in just a few years, the Rajneeshee’s built a small town literally from the ground up. According to the book, Bowerman and the Men of Oregon, by Kenny Moore, a growing group of red-clad sannyasin (followers) cleared 3,000 acres of Big Muddy, grew fruit, wheat and vegetables, raised cows and chickens, built a dam, a 40-acre reservoir and an irrigation system, a power sub-station, a sewage system, a phone system, a runway for their airplanes, and a transportation system of 85 school buses. True, they used 50 million dollars in contributions from its 200,000 worldwide followers, but their Rancho Rajneesh was a labor of love for the sannyasin, and an incredible achievement. And so proud were they about their creation, they were willing to fight to keep it. However, the Oregonians living near and around Rancho Rajneesh were concerned about the strange religious “cult” that had invaded their quiet part of the world. Bowerman’s son, Jon, owned land bordering on Rancho Rajneesh. And over time, the Rajneeshee’s would ensure their safety by beefing up their security. At first stunned at the scale of Rancho Rajneesh, and the brashness of their denizens, local citizens began to push back. Bill Bowerman, who was constantly in conversation with state and local authorities regarding the ongoings of the Rajneeshpuram, decided to form a non-profit organization, Citizens for Constitutional Cities, that raised funds to legally oppose the Rajneeshees. In his press release, he laid down the gauntlet. My ancestors have lived in Oregon since 1845. My son Jon is a rancher in Wheeler County. Bowermans past, present, and future are deeply committed to this state. Thousands like me have become concerned about the effect this group has had on its neighbors. As an educator and coach at the University of Oregon, I have always welcomed and encouraged new ideas and diverse people to come and live in this great state, irrespective of race, creed, national origin, or religion. Citizens for Constitutional Cities is going to monitor the activities of the Rajneeshee and challenge them in court if necessary to avoid the creation of unlawful cities in this state and protect our citizens from harassment and intimidation in violation of Oregon and United States Constitutions. In the statement, Bowerman includes phrasing to diminish the idea that his organization was about religious discrimination, which the Rajneeshee’s claimed was the case. As the documentary powerfully shows, the bigger issues may have been attempts by certain leaders within the Rajneeshees to win power in local municipalities in order to ensure their legal status as a city. According to the documentary, their tactics included importing people (primarily homeless people from across America) to vote on their behalf, harassment, mass poisoning, and attempted murder. In the end, the Rajneeshees failed to convince the authorities that they were victims of religious discrimination. On the contrary, they were found to have violated the US Constitution’s directive to ensure separation of “Church and State,” as the incorporated entity of Rancho Rajneesh did not appear to clearly separate government leadership from religious leadership. Bowerman was in the middle of this constitutional fight, and as he had done his entire life, he won. I heavily encourage you to watch Wild, Wild Country. Posted in Environment, Geo-politics, Olympics, Pop Culture, security, Social Issues and tagged Bhagwan Shree Rajneesh, Big Muddy Ranch, Bill Bowerman, Bowerman and the Men of Oregon, Citizens for Constitutional Cities, Jon Bowerman, Ma Anand Sheela, Netflix, Rajneeshee, Rancho Rashneeh, Wild Wild Country. Bookmark the permalink.